The science dealing with the arms of the past – Waffenkunde, hoplology – developed during the second half of the nineteenth century and was continued in assorted environments in the course of the following century. This was by no means an academic science, and did not form part of university curricula. Its institutional basis was composed primarily of museums displaying arms, specialised scientific societies or associations of lovers of old arms, whose members included collectors and amateurs. This state of things is retained up to this day. Ultimately, there came into being two schools of historical studies concerning arms: German‑language, concentrating German and Austrian experts, chiefly in Berlin, Dresden, Munich and Vienna, and English-language, i. e. British and American, especially in London and New York. Less significant centres are located in France (the Parisian Muse de l’Armée), Sweden, Denmark, the Netherlands, Italy, Spain, and Central and Eastern Europe: Poland, the Czech Republic, Hungary and Russia. Systematic research was initiated by work on “great inventories” of preserved collections of arms from past epochs: antiquity, the Middle Ages and the modern era, shifting the term “old arms” in time. In the first place, the investigations dealt with typology and terminology, leading to the appearance of lexicons, a field in which pride of place went, once again, to the Germans and the English. (1) Bashford Dean, an outstanding American expert on arms, and a naturalist by training, was convinced that types of arms evolve, similarly to plants or animals, and could be arranged in genetical sequences; consequently, he constructed typological tables. (2) This system corresponded to museum interpretations: arms were put in order, described and shown usually according to uniform types and chronological criteria. A readily applied method was to distinguish between defensive and offensive arms, firearms and cold steel, and ceremonial and hunting varieties. In the distinction of arms a fundamental role was played by actual items, sometimes obtained via archaeological excavations, but also by their depictions in the plastic arts or descriptions found in literature. Attention was paid to the production of arms and their practical function; less concern was devoted to their social determinants and ideological role in culture. In the latter range, the greatest number of theoretical studies and museum displays pertained to ceremonial and tournament arms. (3) Many years ago, the author of this text studied the significance of armour as a symbolic form, an approach which met with interest both at home and abroad. (4) The intention of this particular article is wider‑ranging, namely, to find an answer to a question concerning the essential role of knightly arms in the military sense and in comparison with arms used during the Middle Ages by non-knightly battle formations. Those issues have been examined upon numerous occasions, but the problem consists in the fact that the historians and the sociologists dealing with them were not experts on arms,(5) while the latter, submerged in typology, are usually distant from purely ideological nuances. (6) Indubitably, in the course of the Middle Ages, knights lost their battle merits and were defeated frequently by soldiers who had at their disposal plebeian arms that functioned much better on the battlefield. Knights were the outcome of the mediaeval culture of the West, emerging in a lengthy, several centuries-long historical process, and were subject to incessant transformations. They were by no means an exclusively European phenomenon – their counterparts can be encountered in other distant cultural formations in the Near East, India, China, Japan and Mexico. Everywhere, we come across similar physical and spiritual features: strength, adroitness, resilience, valour, honour, loyalty, righteousness, and the retention of tradition. In the domain of arms, the West European knight was the heir of two great ancient cultures – the Graeco-Roman world and that of the Near East, whose essential impact grew more intense during the Crusades. We must take into consideration also the military achievements of various peoples, especially German, from the era of the great migrations. Nevertheless, almost all types of arms in mediaeval Europe had their counterparts in antiquity. (10) The knights chose the helmet and armour, originally mail and plate, and then plate armour, and as their basic offensive arms – the sword and the spear, subsequently changed into a lance. In reality, the ancient Greeks and Romans preferred foot formations – the hoplites and legionnaires, armed with shields, spears and swords; auxiliary formations were composed of lightly armed men, equipped with slings, bows and spears. Another auxiliary formation was the cavalry which, in the case of the Romans, was, as a rule, borrowed from the allies. The best cavalry came always from the Orient, for example the Medes, the Persians, the Parthians and the Sassanids. While reforming the Greek-Macedonian army, Alexander the Great created strong cavalry detachments, which made a considerable contribution to his brilliant victories. The classical heavily armed katapbracti and clibanarii were undoubtedly the predecessors of the European knights. (11) The ultimate shaping of the latter was influenced by a single, at first glance slight element: the stirrup, invented in China, borrowed from the oriental nomads, without which the battle tactic, and even horseback riding, would have been probably impossible. Knightly armour developed in the course of several hundred years; its prime task was to create a hero, resilient to all blows, and totally enclosed in steel shielding. The result was a statuary creation, a hollow sculpture, and all efforts were concentrated on guaranteeing the carrier of the armour the opportunity of seeing, breathing, hearing, and, predominantly, of moving and fighting. This feat produced difficulties, today barely imaginable. Finally, it became apparent that it was simply impossible to make armour totally blow-resistant. This can be seen already in the depiction of the Battle of Hastings (1066), shown in the Bayeux Tapestry (12), as well as in the magnificent miniatures (first half of the thirteenth century) in the Maciejowski Bible. (13) Helmets were split by the blows of swords and battle axes, and armour was pierced by lances with increasingly powerful shafts. The military weakness of the European knights became obvious during the first Crusades. Despite the capture of Jerusalem, the knights suffered defeat in a confrontation with the Oriental light cavalry, armed with bows and lances. The Crusaders were compelled to seize or defend fortified towns and castles, a task for which they were unprepared, and in which their horses, frantic charges and bold duels proved to be totally useless. (14) Outremer, the knights encountered climatic and geographic conditions different from those in Europe – deserts, scorching sunshine and a lack of water, together with unfamiliar war tactics, the elusive nature of the cavalry, sophisticated battle devices, inherited from antiquity and improved by the Moslems, as well as fire missiles and Greek fire. Individual courage, strength and physical prowess lost their importance, and the significance of armour, the sword and the lance – diminished. In time, knightly arms, having failed in wartime conditions, succumbed to a sui generis transformation, and increasingly distinctly assumed ideological importance by becoming the apparel and outfitting of Christian holy knights, especially St. George and even the Archangel Michael. The Archangel portrayed in the Last judgment triptych, the Gdansk altar painting executed by Hans Memling, wears luminous armour of the sort produced at the end of the fifteenth century by the most outstanding armourers of Milan. St. Michael is a foot knight, but he battles against Satan by brandishing the cross, which in this case fulfils the function of a lance. The latter remains an almost sacral weapon in the hands of St. George in innumerable scenes of defeating the dragon-Satan. This fact is associated closely with the holy lance, the lancea sacra, which is part of the imperial insignia, the lance-reliquary, concealing a nail from the Holy Cross, whose rather faithful copy, fortunately preserved in the treasury of the Cracow cathedral, was presented to the Polish Duke Boleslaw by Emperor Otto III, on a pilgrimage to the tomb of St. Wojciech (Adalbert) in Gniezno. The lance, conceived as the weapon which pierced the side of Jesus, dying on the Cross, was subjected to unquestioned sacralisation. Armour, together with the helmet and the shield, was granted new life as the ideal costume of the knight in painted and sculpted likenesses, especially in tombstone art and heraldry. At times, the knight himself was transformed into a heraldic form, and became a coat of arms. As a rule, the armorial field was the old, thirteenth-century triangular shield, crowned with a heraldic coat of arms with mantling. Knightly arms became subjected to negative ideological transformation in artistic works illustrating the passion of Jesus, whose oppressors are dressed in deformed, “horrible” armour and helmets. (18) This phenomenon occurred also in actual objects – the pillory helmets, the wearing of which constituted one of the most severe penalties. (19) An actual “anti-knight” was the Raubritter, who used his strength and arms for the purposes of robbery and acts of violence, known particularly in the German lands. Not without reason did Albrecht Durer portray him in the company of Death and the Devil. 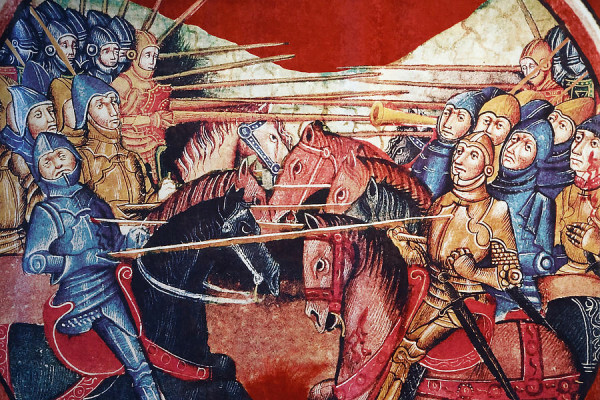 This category of degenerate forms included knights who took part in jousts professionally, and whose sole target was winning the prize, especially the precious armour of the defeated opponent. Such a wandering knight, albeit by no means a treasure hunter, was the Silesian Niclas von Poplau, born in Wroclaw, who wielded an enormous lance, the object of admiration and cause of astonishment, and whose invaluable travel diary has been published recently, together with an excellent commentary. (20) Only a single step led to the adventures of Don Quixote, neurasthenic and mythomaniae, with which Cervantes sealed the fate of European knighthood. Nonetheless, the helmet and armour survived the demise of the chivalric epoch. During the Renaissance, they assumed a ceremonial or grotesque shape, in imitated alla romana forms patterned on the naked male torso, and helmets resembling lion heads, griffins or chimeras. Armour and the helmet survived in assorted battle formations up to the twentieth century. The steel or synthetic helmet and the bullet-proof vest underneath camouflage fabric mould the figure and protect the present-day soldier, who from the knightly ethos has borrowed only strength, prowess and courage. Similarly as in the case of armour, ideological transformation affected the knightly sword, the main offensive weapon, and a prolongation of the knight’s arm. Inherited from antiquity and altered upon numerous occasions. For a long time it remained essentially unchanged, and composed of a simple double-edged blade and a handle with a guard and a pommel, carried in a sheath and suspended on a belt. The sword served in direct confrontation, which applied the sweeping blow; thus, the decisive factor was not solely the art of swordsmanship, but predominantly the strength of the user. The battle sword could display production marks and inscriptions, more rarely coats of arms and devotional emblems; devoid of lavish decoration, it was always the object a cult, surrounded by legend or mystique, and given names, similarly to a person or a deity. Associated with King Arthur and the Knights of the Round Table, or with Charlemagne and his barons, presented by mysterious hands reaching out from a lake or drawn from a rock, in the mediaeval myth it was ultimately sacralised as a symbol of supreme divine, imperial and regal authority. Used for coronation and knighting ceremonies, it was simultaneously the symbol of highest judgement, appearing in the hands of kings, but also held by popes and bishops. For many centuries, the popes blessed swords which, together with hats, were sent to deserving monarchs defenders of the faith. (21) In other cultures too the sword was a holy object, as witnessed by the double-edged sword of Zulfikar, the sword of Mohammed and Ali, the symbol of warring Islam. (22) At the same time, the sword was an instrument of punishment, and, wielded by the henchman, it became desacralised, giving rise to terror and repulsion. An alternative weapon for meting punishment was the battle-axe, an object of ancient genealogy, which ultimately, in a diminished form, appeared in the hands of knights. Basically, it points towards plebeian arms, derived from a wedge-shaped instrument used by carpenters and woodcutters or simply by peasants for farm work. It seems worth recalling that already Roman lictors beheaded their victims by means of small axes carried within a bunch of reed-like fasces, which were first used for scourging the condemned. The axe became the origin of the most effective plebeian weapon of the Middle Ages, next to the long lance, namely the halberd, particularly developed by the Swiss – a combination of the axe, the lance and the hook. It was the Swiss blacksmiths who devised a technique of forging the point of the halberd with a core made of soft iron and a steel point, preventing the crumbling of the weapon even during the most powerful blow. Plebeian hafted weapons appeared in assorted varieties, such as the berdish, glaive, gisarme, runka, lance or simply a fork or a scythe blade movated on a shaft, used almost up to the twentieth century. Obviously, peasant arms originated from tools found on the farm, or were the products of village blacksmiths. A separate group was composed of plebeian long-range weapons: the sling, the bow and the crossbow, defined also as propellant weapons. The sling was an ancient manual weapon, probably of Eastern origin, rendered famous by the victory won by David over Goliath, and used in the West up to the fifteenth century, sporadically even longer. (26) The ordinary sling was composed of two sections of medium-wide rope, joined with a leather or fibre tab, which supported a stone or a metal, usually leaden missile. Holding both ends of the rope in the hand, the sling was set into circular motion, gaining a considerable cumulation of energy; at a suitable moment, one of the ends of the rope was let loose, in this way projecting the missile by means of centrifugal force. The other variety was the shaft sling of greater range owing to a longer arm of the force, achieved by attaching one of the ropes to a short shaft. In practice, the sling missiles reached a distance of up to 100 metres, but using this weapon demanded enormous expertise. During the eleventh and the twelfth century, the West European bow (about 100 centimetres long) was used by foot soldiers. Sometimes, it was employed by running men, who drew the bow keeping the right hand at the level of the chest, while the additional arrows were held, together with the stave, in the left hand. The arrows were stored in an elongated, cylindrical or flat quiver made of leather, hung across the left shoulder or suspended on a belt, and carried on the right hip. The mediaeval crossbow was composed of a hard, springy stave, originally made of wood, then of glued layers of wood, sinews, and horn, similarly as in the bow, and, finally, of steel with a thick string, made of strongly twisted hemp, which required the use of special equipment. The bow was attached to a base, known as a column, which contained a groove for the arrow, with a massive iron bolt on a shaft with wooden feathers. It also included a trigger lever for loosening the string, set into motion by the pressure of a finger. This purpose was served by a revolving cylinder made of bone or horn, the so-called nut, with two incisions. One was intended for the string, and the other supported the end of the metal lever. This ingenious mechanism, a combination of simplicity and great effectiveness, was later utilised partly in the construction of firearms. The distinguishing feature of the crossbow was its special accuracy and force of puncture, but its fault were its slowness of firing compared with the long bow, it was not so easy to draw the bow. This operation involved the use of a metal hook and, subsequently, a mechanical crank or lever, known as the goat’s foot. In order to render this activity easier, the end of the column contained a stirrup affixed for supporting the foot. During the Middle Ages, this was a truly wondrous weapon, but it comprised a total negation of chivalric ethics. The boldest knight could easily perish from a missile hurled by the crossbow and aimed from behind trees, a wall or a wagon. Soon, the crossbow was recognised to be an ignoble and wicked weapon. The Church tried to prohibit its usage already at the Second Lateran Council of 1139, albeit only against Christians; it was considered permissible to use it to kill “pagans”. This decree was repeated in a special bull issued by Innocent II at the end of the twelfth century, but in vain. In accordance with the principle of war, the striving at overcoming the enemy ignored ethical and religious admonitions. From the thirteenth century, detachments of foot soldiers of plebeian origin, usually mercenary, and then mounted crossbowmen, were regarded as decisive for the outcome of battles and sieges. Particular renown was enjoyed by the crossbowmen of Genoa. The above outlined problems lead to a conclusion about two contrary styles and systems of mediaeval arms: knightly and plebeian, with the second prevailing and initiating a new epoch of wars. In reality, people who met on the battlefield observed each other closely and drew conclusions from their experiences, at times extremely unpleasant. The knights were frequently compelled to dismount, abandon their traditional tactic, reach for curved-blade and hafted arms, conducted tournaments on foot, wielding halberds or axes, and resort to firearms, rather unfortunately, as has been mentioned. At the same time, foot soldiers used helmets, as a rule open, and half-armour, especially in lancer formations, fought with two-handed “Swiss” swords, and sought refuge behind circular or rectangular shields. There were no formal or ideological restrictions since greatest importance was attached to the battle effectiveness of the arms. With certain exceptions, old encyclopaedic publications continue to be valuable: A. Demmin, Die Kriegs–waffen in ihren geschichtlichen Entwickelungen von den altesten Zeiten bis auf Gegenwart, eine Encyk–lopadie der Waffenkunde, Leipzig 1869; 4th ed. 1893, 2 supplementary volumes: Wiesbaden 1893,1896; W. Boeheim, Handbuch der Waffenkunde, Leipzig 1890, and G. C. Stone, A Glossary of the Construction, Decoration and Use of Arms and Armor in All Countries and at All Times, Portland (Maine), phototype re-edition New York 1961. B. Dean, Handbook of Arms and Armor, European and Oriental, New York 1930; cf. also M. Davenport, The Book of Costume, New York 1956, pp. 153-158. Das ritterliche Turnier im Mittelalter, Gottingen 1985; S. K. Kuczyriski, Turnieje rycerskie w sredniowiecznej Polsce (Knightly tournaments in mediaeval Poland) in Biedni i bogaci: studia z dziejdw spoleczeristwa i kultury ofiarowane Bronislawowi Geremkowi w 60. rocznicg urodzin (The Poor and the Rich: Studies from the History of society and culture offered to Bronislaw Geremek on His Sixtieth Birthday), Warszawa 1992, pp. 295-305. Z. Zygulski Jr., Sredniowieczna zbroja szydercza (Mediaeval derisive armour) (in:) Sztuka i ideologia XV w. (Art and Ideology in the Fifteenth Century), ed. P. Skubiszewski, Warszawa 1978, pp. 587-608, and idem, Armour as a Symbolic Form, “Waffen – und Kostumkunde”, Munchen-Berlin 1984, fasc. 2, pp. 77-96. M. Ossowska, Ethos rycerski i jego odmiany (Chivalric Ethos and its Varieties), Warszawa 1973. An exceptional study combining both aspects is: D. Piwowarczyk, Obyczaj rycerski w Polsce pdznosredniowiecznej (XIV-XV wiek) (Knightly Customs in Late Mediaeval Poland /Fourteenth-Fifteenth Century/), Warszawa 1998. M. Glosek and A. Nadolski, Miecze gredniowieczne z ziem polskich (Mediaeval Swords from Polish Lands), Lodi 1970; M. Glosek, Znaki i napisy na mieczach sredniowiecznych w Polsce (Marks and Inscriptions on Mediaeval Swords in Poland), Wroclaw-Warszawa-Krakow-Gdansk 1973; idem, Miecze grodkowoeuropejskie z X‑XV w. (Central European Swords from the Tenth-Fifteenth Century), Warszawa 1984, and idem, Pdznogredniowieczna brori obuchowa w zbiorach polskich (Late Mediaeval Crushing Arms in Polish Collections), Warszawa-Lodz 1996. Uzbrojenie w Polsce sredniowiecznej 1350-1450 (Arms in Mediaeval Poland, 1350-1450), ed. A. Nadolski, Lodz 1990 and Uzbrojenie w Polsce gredniowiecznej 1450-1500 (Arms in Mediaeval Poland, 1450-1500), ed. A. Nowakowski, Torud 1998. Z. Zygulski Jr., Bron starozytna. Grecja. Rzym. Galia. Germania (Ancient Arms. Greece. Rome. Gaul. Germany), Warszawa 1998. O. Gamber, Katapbrakten, Clibanarier, Normannenreiter, “Jahrbuch der Kunsthistorischen Sammlungen in Wien” 64 (1968), pp. 7-44. J. G. Mann, La Tapisserie de Bayeux, Paris 1957; The Battle of Hastings. Sources and Interpretations, publ. S. Morillo, Woodbridge 1995: S. Bertrand and S. Lemagnen, The Bayeux Tapestry, Rennes 1996. S. C. Cockerell, M. R. James and C. J. foulkes, A Book of Old Testament Illustrations of the Middle of the Tbirteentb Century sent by Cardinal Bernard Maciejowski to Shah Abbas the Great, King of Persia, now in the Pierpont Morgan Library at New York, Cambridge 1927. A. A. Settia, L’Europeo aggressore.. tecniche militari in Occidente alla vigilia della prima crociata, “Studii Storici. Rivista trimestrale dell’Istituto Gramsci”, April-June 1997, pp. 309-322; D. Nicolle, Knight of Outremer 1187-1344, Osprey Military Warrior Series 18, London 1996; C. Caier, La valeur militaire des armies de la premiere Croisade, review of the exhibition: Le temps des Croisades, Huy 1996, Bruxelles 1997; cf. also bibliographic remarks: C. Gaier, De quelques tendances actuelles de l’historlographie militaire medievale, “Le Moyen Age – Revue d’histoire et de philologie”, no. 2, Bruxelles 1998. M. Howard, Wojna w dziejach Europy (War in European History), Wroclaw-Warszawa-Krakow 1990, passim; C. Rothero, The Armies of Agincourt, Osprey Military, Men-at-Arms Series 113, London 1981. A. Nadolski expressed the opinion that this was a battle waged exclusively by mounted knights, Grunwald 1410. Riddarlek och Tornempel. Tournament and the Dream of Chivalry, ed. L. Rangstrom, Stockholm 1992. Z. Zygulski Jr., Armour as a Symbolic Form, p. 93. Opisanie podrozy Mikolaja von Popplau rycerza rodem z Wroclawia (A Description of a journey by Niclas von Popplau, a Knight of Wroclaw), prep. by P. Radzikowski, Krakow 1996; German edition: Reisebeschreibung Niclas von Popplau, Ritters biirstig von Breslau, Krakow 1998. Z. Zygulski Jr., Miecz i kapelusz poswiecany krola Jana III Sobieskiego (The blessed sword and hat of King Jan III Sobieski), “Studia do dziejbw Wawelu”, vol. 4, Krakow 1978, pp. 333-360. Z. Zygulski Jr., Ottoman Art in the Service of the Empire, New York-London 1992, pp. 46-50. Z. Zygulski jr., Bron wscbodnia. Turcja. Persja. Indie. Japonia (Oriental Arms. Turkey. Persia. India, Japan), Warszawa 1983, p. 42. Z. Zygulski Jr., Bron starozytna, p. 175. S. Bertrand, S. Lemagnen, The Bayeux Tapestry, scene 51. M. Gradowski, Z. Zygulski Jr., Slowrcik uzbrojenia historycznego (Dictionary of Old Arms), Warszawa 1998, s.v. Sling. J. Werner, Polska bron. Luk i kusza (Polish Arms. Bow and Crossbow), Wroclaw-Warszawa-Krakow-Gdansk 1974. W. Reid, The Bowman’s Thumb-Ring. Tool of Asia’s Warriors and Hunters, “Materialy Muzeum Wngtrz Zabytkowych w Pszczynie”, vol. 7, Pszczyna 1992, pp. 248-262. J. G. Mann, Armes et Armures (in:): La Tapisserie de Bayeux, p. 67; W. Reid, The Lore of Arms, London 1976, p. 129. Z. Zygulski Jr., Bron starozytna, p. 97, fig. 94. A. Topping, The First Emperor’s Army. China’s Incredible Find, “National Geographic”, 1978, no. 4. A.V.B. Norman, D. Pottinger, English Weapons and Warfare 449-1660, Englewood Cliffs, N. J. 1979, pp. 97-100. C. Blair, Early firearms (in:) Pollard’s History of Firearms, Feltham (Middlesex) 1984, pp. 25-32. Z. Zygulski Jr., Oriental and Levantine firearms (in:) Pollard’s History, pp. 425-428. C. Blair, Early firearms, p. 25. Ibidem, p. 28, also: A.V.B. Norman, D. Pottinger, English Weapons, op. cit. p.98. Z. Zygulski Jr., The Wagon Laager, “Fasciculi Archaeologiae Historicae”, vol. 7. Z. Zygulski Jr., Slawne bitwy w sztuce (Famous Battles in Art), Warszawa 1996, p. 78 and 90. This entry was posted in Articles and tagged arms and armor, Austria, Bayeux Tapestry, China, Crusades, Czech Republic, Eastern Europe, England, Germany, Hungary, Persia, Poland, Renaissance, Roman Empire, Russia. Bookmark the permalink.